We took advantage of our ability to spontaneously up-and-go last week-end. Friday was a warm, sunny day and the weatherman predicted the same for Saturday and Sunday, only warmer! and 20% chance of rain. I ditched my plans, packed some clothes, and fixed some foil dinners. Casey uncovered the camper, hitched it up, and off we went to nearby Harmonie State Park. The trailer has been winterized since November, which means the water lines have anti-freeze in them, but there’s no water hook-ups at Harmonie (or damn few) anyway. We had a nice evening and woke up to thick clouds and drizzles that eventually turned into an all-day, steady rain. The predicted highs in the sixties? Ha! It got up to about 54. We salvaged the day on Sunday, though, and hiked, cooked bacon/eggs over the campfire and had those foil dinners. This was Wink’s first outing in the camper. In fact, I don’t think he has been in a car since he was neutered. Casey’s been taking him outside for “walks” on a leash in preparation. 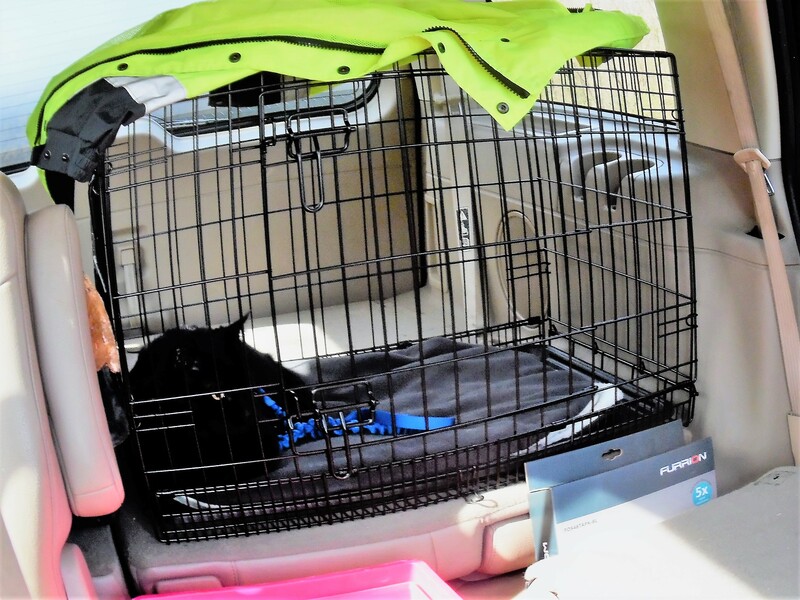 We got a nice-size cage, brought along treats, and loaded up the litter box. He did great! He mewed quite a bit, but let up after the first 15 miles. Once in the camper, he found a hiding spot and was skittish at first. He sniffed around and explored the camper (he’d never been in it) and decided it was okay by the second day. When we drove home, he barely made a sound. We came back Monday and brought Olivia and Samantha over to play. It was a beautiful day, like the one they told me it would be on Saturday. My birthday-week plans are skewered now, so I guess we’ll have to party into next week-end.